I’ve had these 2 XL t-shirts moving from drawer to drawer for the past 2 years. 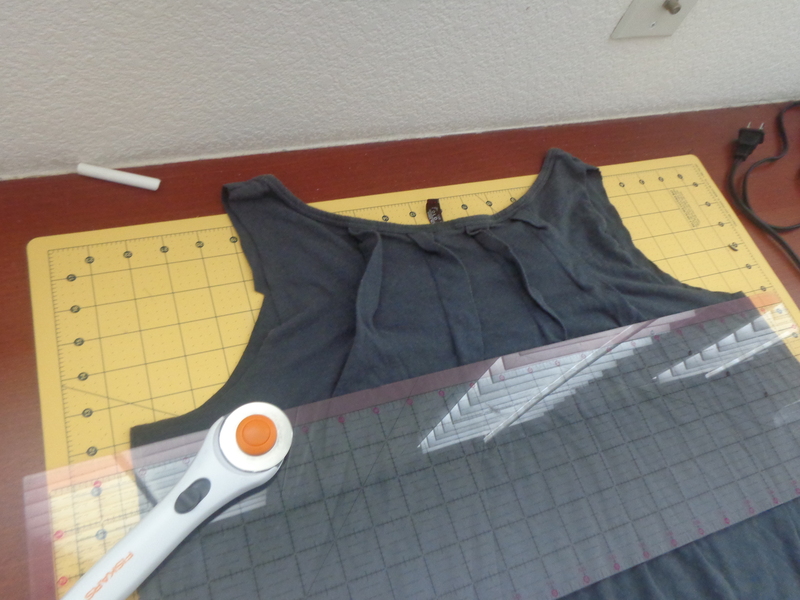 I finally decided I was going to make another upcycled t-shirt dress. It was going to be so great and cute and everybody was going to ooh and ahh all over and pin it on Pinterest a million times with captions of how they were going to make one too right now… And when everything was said and done it looked terrible. 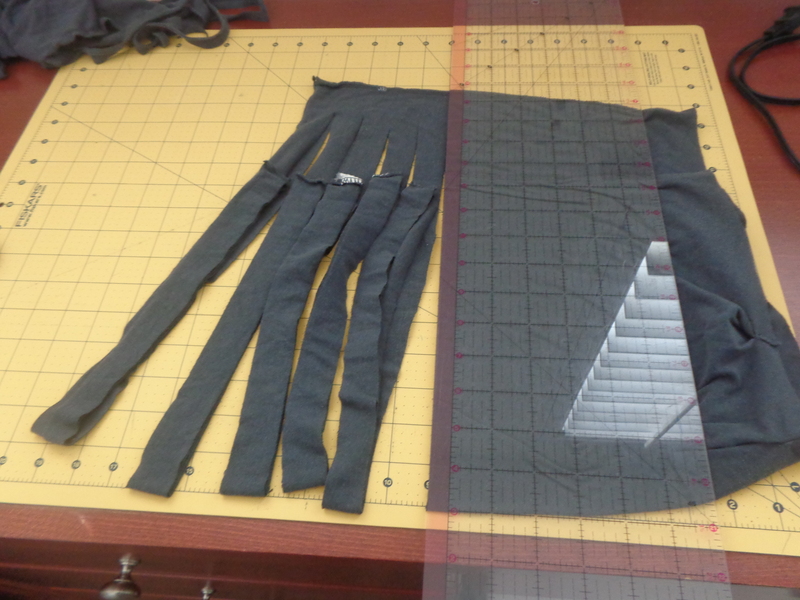 The shirts already started off with wonky seams and the wonkiness just pervaded the entire project. Rather than admit defeat I took my failed project and cut it up! 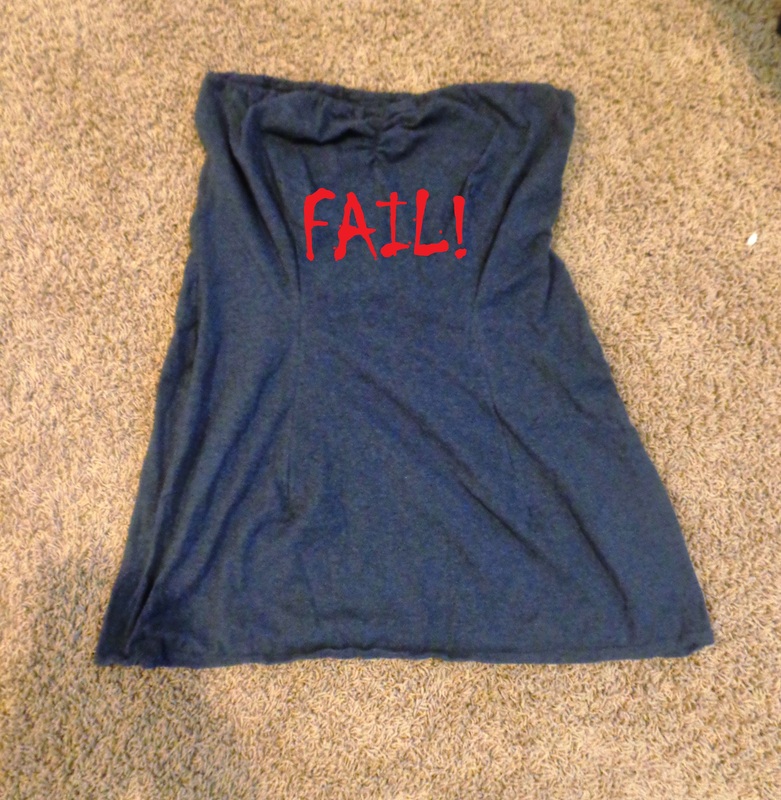 T-shirt yarn (tarn as some have coined it) is the failed T-shirt craft’s chance at salvation! The blue basket is my fail to fabulous and is crocheted. The dark gray basket is a T-shirt that had a bleach stain and a hole at an inopportune location on it. I used a combination of knitting and crochet on that one to see the effect of it. First, let make the T-shirt yarn. 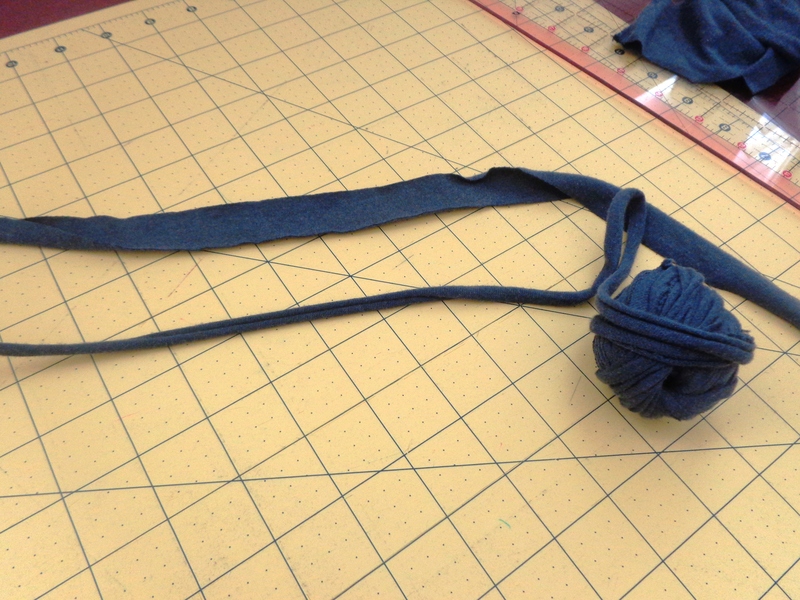 There are a couple of effective ways to make t-shirt yarn. One way is to cut long slits horizontally along the width of the tee without cutting all the way to the edge and then cutting up the next row over. 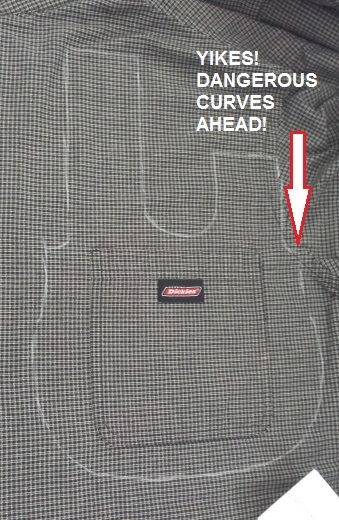 The other way is to cut one continuous spiral all around the shirt. I’m going to show you the first way. Lay your T-shirt flat. Cutoff the sleeves. It’s just easier to work with. 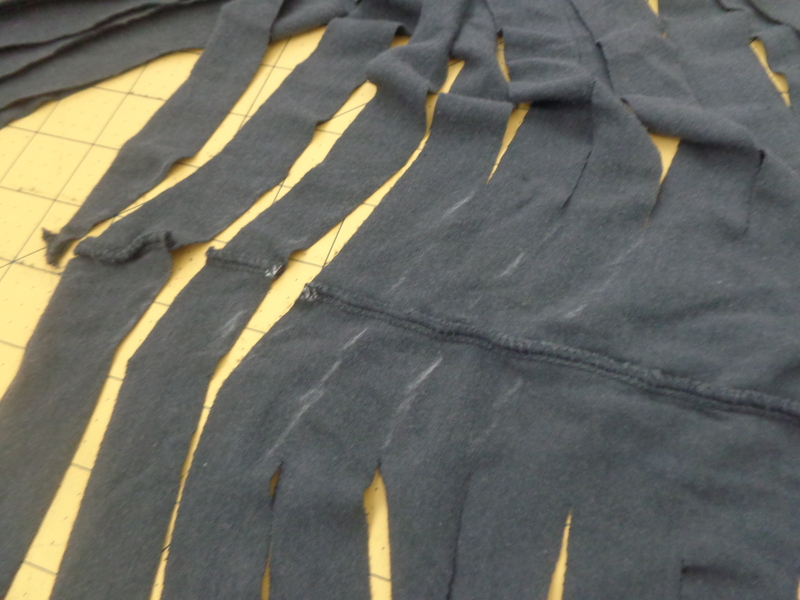 Save the sleeves for another project or cut them up to make more yarn. 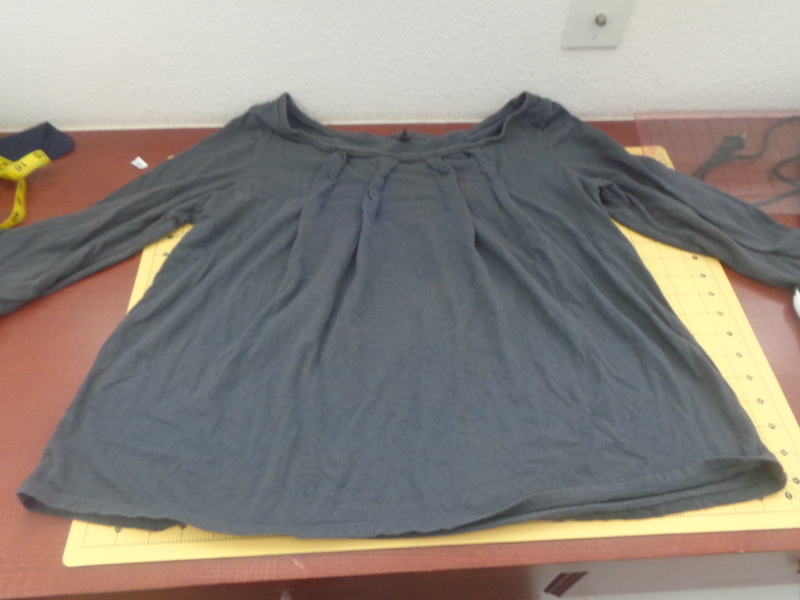 Next, cut the shirt horizontally under the arm pit all the way across. 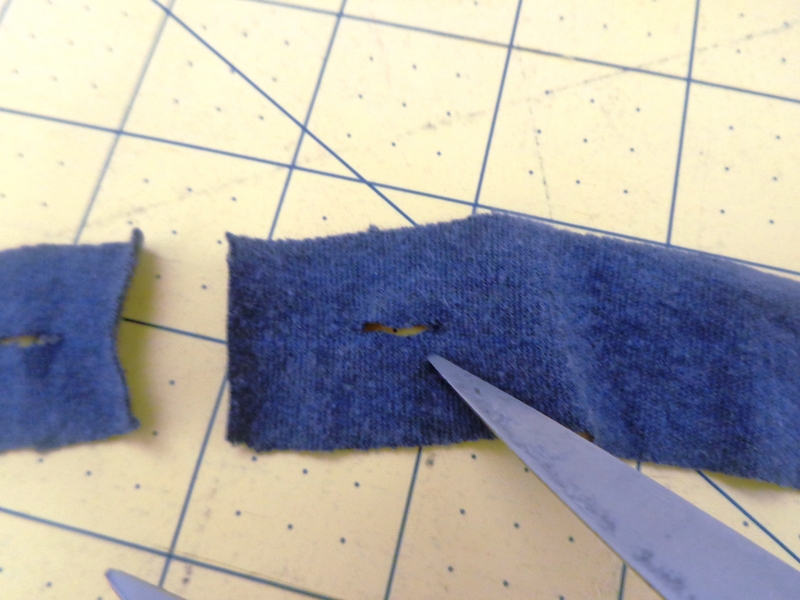 Cut off the bottom hem. 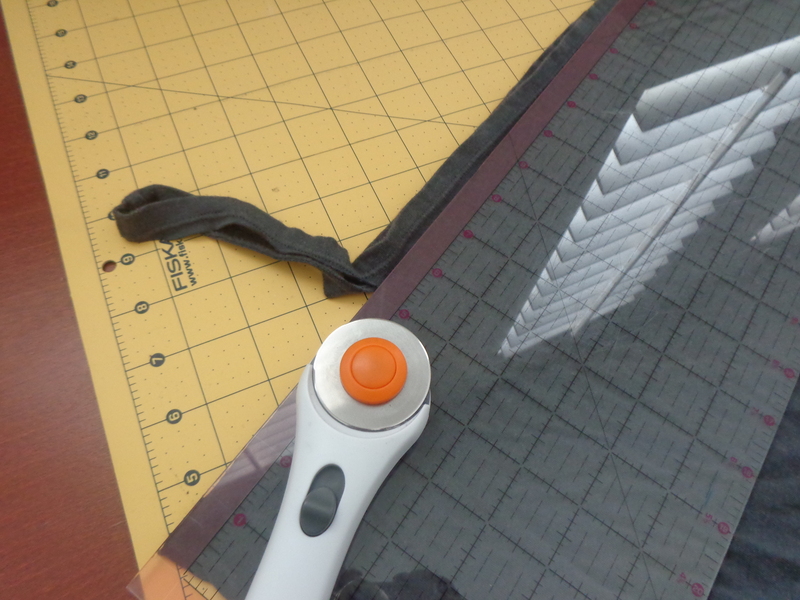 Then using a rotary cutter cut long strips 1 inch wide up to about an inch or so from the edge. Do not cut all the way through. 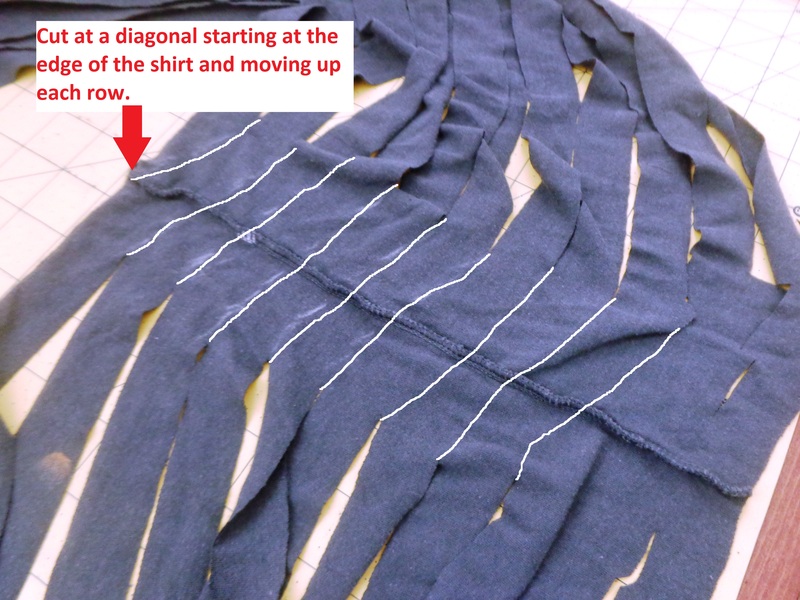 Taking the uncut portion, lay that part flat and cut up to the next row in a diagonal. 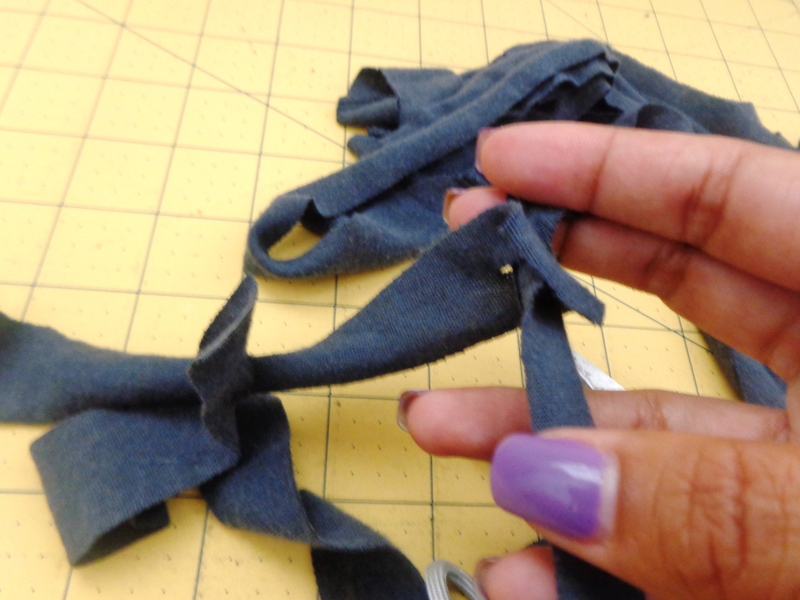 Cut into one inch strips but not all the way through. Thicker for thicker yarn, thinner for thinner yarn. Now you have one really long strip. 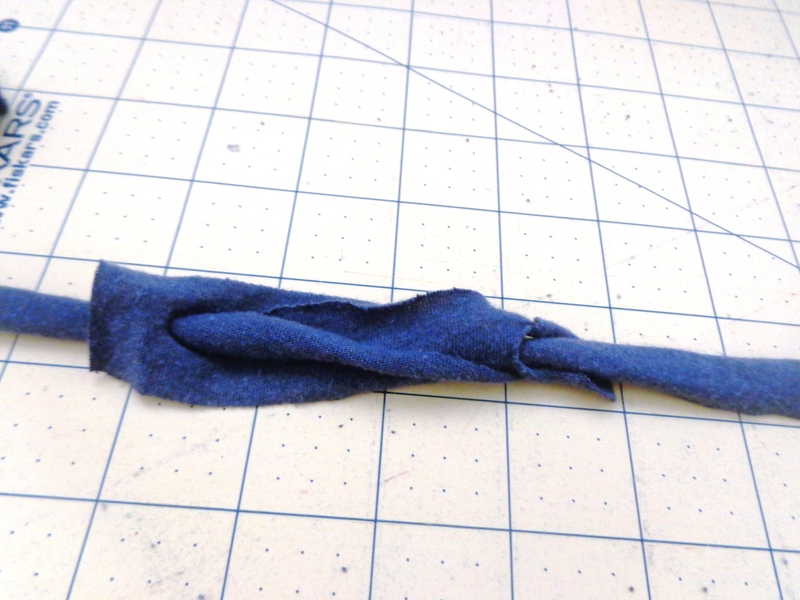 Stretch the strip until it curls up on itself and it begins to look like string. Wind it up into a ball while stretching it. 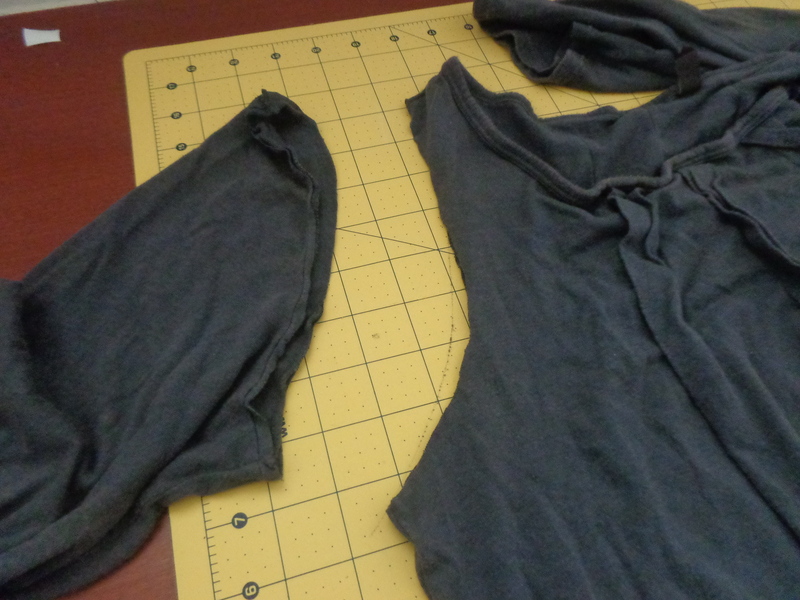 Here’s what you do to splice two lengths of T-shirts yarns together. Rather than tying a knot and having a kink or bump in your work, you’ll want to attach the two yarns together by cutting a tiny slit on one end of each of the yarns you want attached. Thread the shorter yarn into the slit of the longer one. Then take the opposite end of the shorter yarn and thread it through itself. Pull until the two yarns interlock. Your T-shirt yarn is ready to use! Before I get into how to put the baskets together, I want to make sure you know a couple of things. 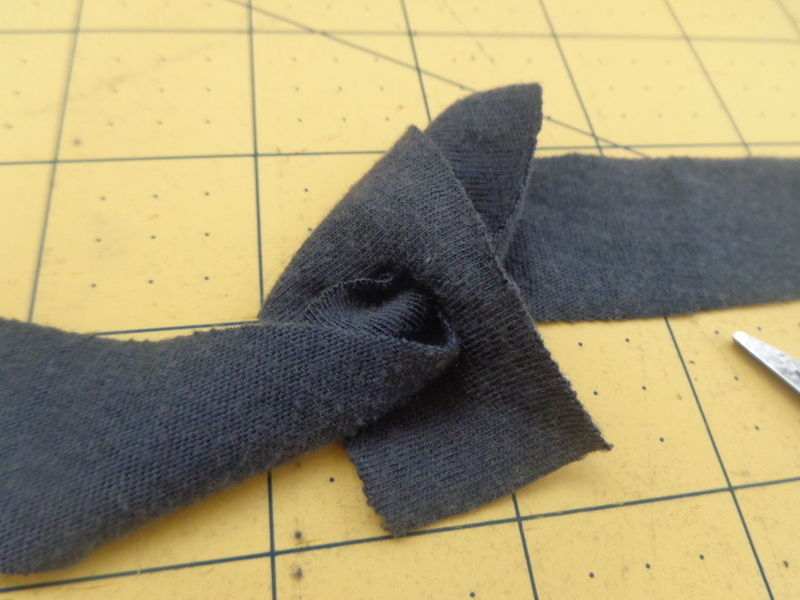 Firstly, these are more of a guideline than a pattern as I didn’t give specifics about gauge. They are both knit/crocheted in a continuous spiral. You can change up the pattern on the body portion the basket to showcase your skillz that pay da billz, or stick with the basic stitch. Choose a hook or needles that will give you a tight stitch as you want the basket to be sturdy and be able to stand up on its own. 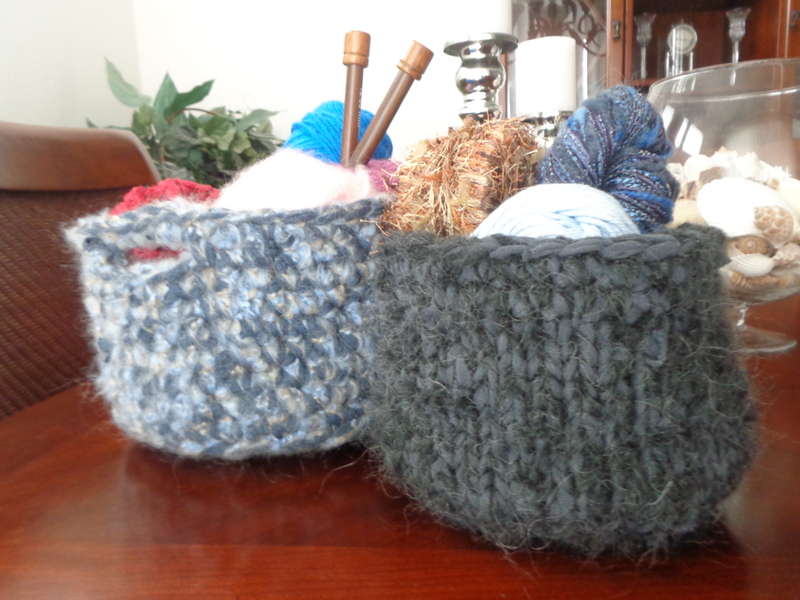 T-shirt yarn – I used 1 and a half XL men’s T-shirts to make the basket. Crochet hook – Size N – larger or smaller depending on how tight you crochet. If you will be just crocheting the T-shirt yarn by itself, maybe go with a size K hook. * Optional – Non- T-shirt yarn. I used Paton’s Divine yarn. I think it’s discontinued. Choose a yarn that’s pleasing to you or just leave the t-shirt yarn by itself. I chose to add the other yarn because I wanted it to be really thick, use up a bit of stash and give it another textural dimension. Holding one strand of t-shirt yarn and one strand of Paton’s Divine together ch 2.
rnd 1 – 8 sc in 2nd ch from hook. Place marker. Do not turn. You will crochet in a continuous spiral. If you want a larger circumference basket, continue increasing in this manner until you have the desired diameter. If you want a taller basket, continue more rounds until you have the desired height (factor in about an inch and half or so for the handles). Create the handles – rnd 15 – sc in next 10 sts, chain 5, skip next 5 sc, sc in next 19 st, chain 5, skip next 5 sc, sc in next 9 sts. rnd 16 – sc in next 10 sts, 5 sc in ch 5 space, sc all the way until you get to the next ch 5 space. 5 sc in chain 5 space. Sc in next 9 sts. Tie off and weave in ends. Crochet hook – Size N – larger or smaller depending on how tight you crochet. You want the stitches to be tight so the basket is able to stand up on its own and have some girth to it. 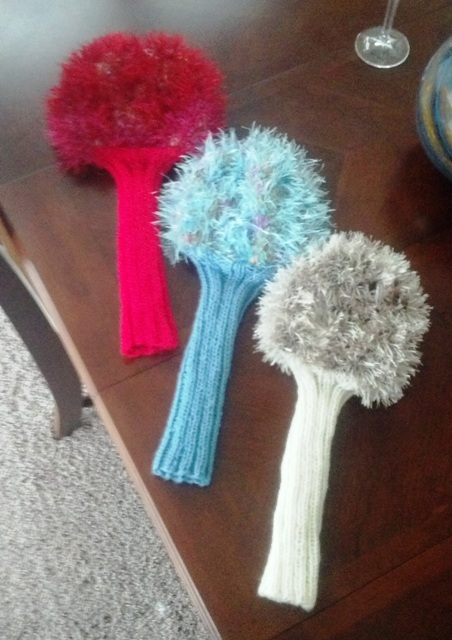 If you will be just crocheting the T-shirt yarn by itself, maybe go with a size K hook. Stitch marker* Optional – Coordinating “regular” yarn. I used Paton’s Divine yarn in this project too. The base of the basket, handles and rim are crocheted. The body is knit. Base: Using crochet hook size N and holding one strand of t-shirt yarn and one strand of Paton’s Divine together, ch 2. Follow rounds 1-5 for the blue basket above. Again, if you want a wider basket, continue increasing in the same fashion until desired diameter ending at your stitch marker. Body: Using your crochet hook, pick up 40 stitches and transfer on to your knitting needles as you go. Stockinette stitch in the round (knit continuously) until you reach your desired height (factoring in about an inch and a half or so for the handles) ending at your stitch marker. Make the handles: Using the crochet hook, bind off 40 stitches loosely. Do not cut off. Using the last loop in the bind off and continuing in the spiral (in other words, do not turn), single crochet in the next 8 sts, ch 4, skip the next 4 sc, sc the next 16 sts, ch 4 , skip the next 4 sc, sc in the next 8 sts. Do not turn, sc in the next 8 sts, 4 sc in chain 4 space, sc in next 16 sts, 4 sc in chain 4 space, sc in next 8 sts. Tie off and weave in ends. Fail to fantastic! I love redemption projects! What failed projects have you transformed? 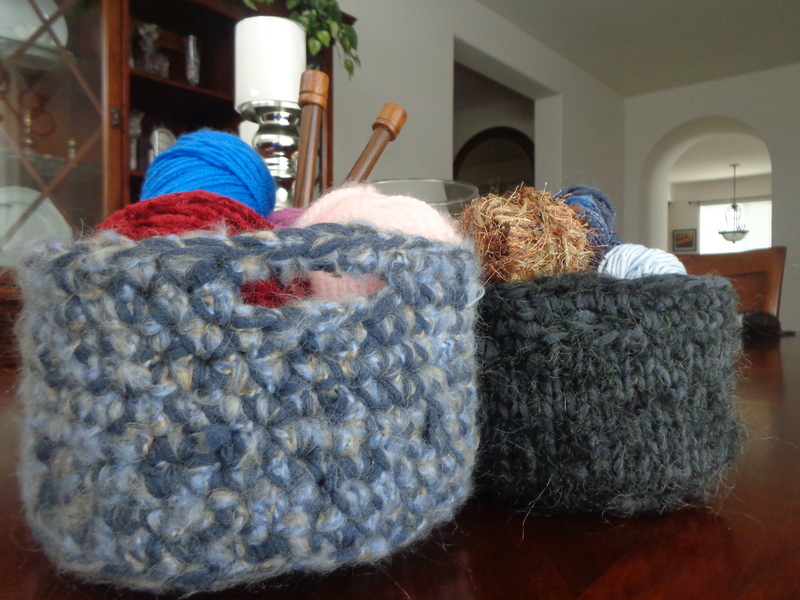 This entry was posted in Crochet, DIY, Uncategorized, Upcycle and tagged basket, crafts, crochet, t-shirt, tarn, upcycle, yarn. Bookmark the permalink. I keep making t-shirt yarn and have yet to actually make anything! Mostly I have just come across the idea of making rugs. I love this idea. Functional and so attractive. Thank you! I am conjuring up a few more projects with t-shirt yarn that I hope to post in the near future! I never thought of knitting them too…! But I loved crocheting baskets too and it seems like they’ve been appreciated as gift bags. Your way of connecting two yarns is genius, a lot handier than just hiding the ends away as I’ve done so far. Aw, thanks! I wish I can take credit for that! I saw it on a YouTube video a while ago. But I can’t seem to find it now. I would recommend using smaller needles to get a tight gauge on the knitting. 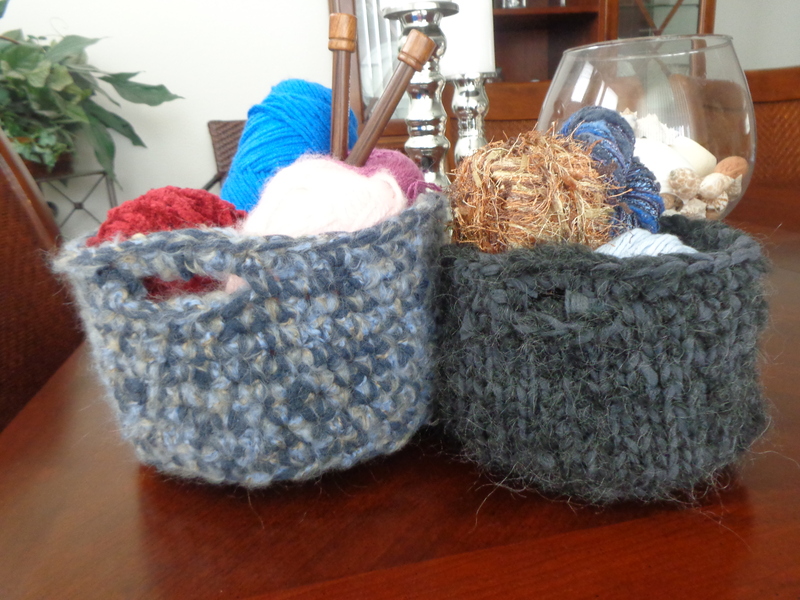 My knit basket can stand up, but I can definitely feel the difference in sturdiness between the two. 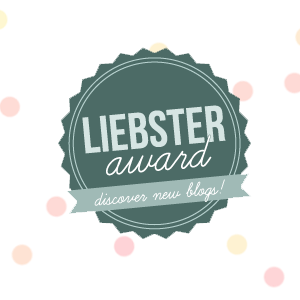 Thank you for visiting my blog this morning. I love the idea of re-purposing an old t-shirt into a very creative basket. 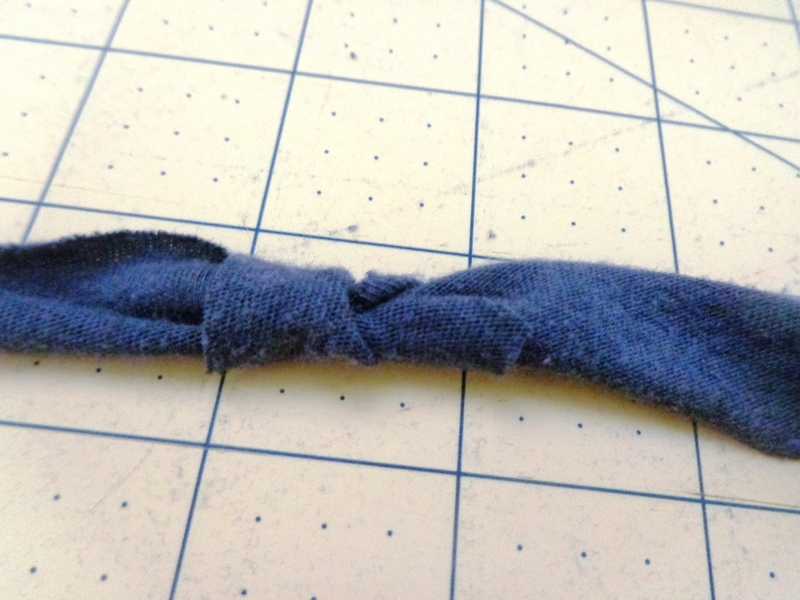 I too learned something: How to join the two ends of fabric! I am off to practice that now. Never worry, I will be back to explore further in the next few days. I have been moving t-shirts from place to place or donating them because I couldn’t think of a thing to do with them. This is a great set of instructions and photos, not to mention wonderful patterns. Thanks! 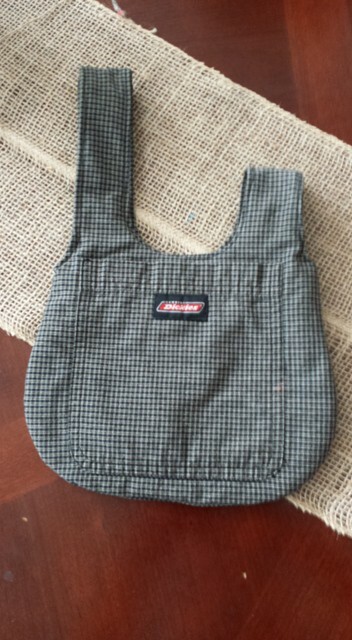 By the way, I found your blog from my own Pattern and Pen site here on WordPress. 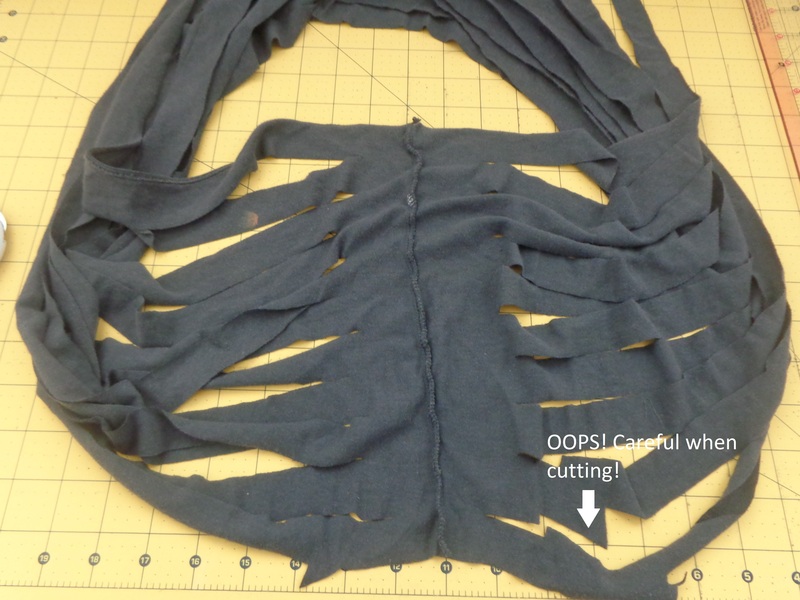 I really need to try this on a ruined skirt I just can’t bare to part with.